Without any data to back their claims, opponents of Kansas’ tax reform maintain that owners of so-called pass-through entities (businesses not organized as regular C-Corporations) haven’t created jobs since their pass-through income was exempt from state income tax beginning in 2013. 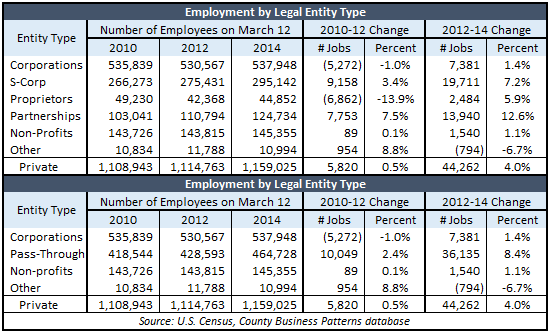 But U.S. Census data not only shows they created jobs, pass-through entities actually created most of the job gains in 2013 and 2014. The 36,000 jobs created by pass-through entities represent 82 percent of all private sector jobs created over the period, and the growth is much more pronounced after tax reform than before. Census only began tracking this information by state in 2010 and hasn’t published 2015 data at this writing so we only have two years of change before and after tax reform to measure; that said, pass-through employment grew much faster after tax reform. Pass-through employment increased by 2.4 percent between 2010 and 2012 but jumped 8.4 percent between 2012 and 2014. Researchers at Arizona State University’s Center for the Study of Economic Liberty brought this Census database to our attention. Dr. William Boyes and Senior Research Fellow Stephen Slivinski will shortly publish “A Thousand Flowers Blooming: Understanding Job Growth and the Kansas Tax Reforms” on behalf of Kansas Policy Institute. LLCs that are taxed as pass-through entities are therefore included in the CBP database as one of several pass-through entity types. The Kansas Department of Revenue confirms that any LLC that filed IRS Form 8832 and chose to be treated as a regular corporation for federal tax purposes would also be taxed as a corporation for state tax purposes and not be considered a pass-through entity. It should also be noted that proprietors and farm workers are excluded from the Bureau of Labor Statistics monthly reports, which means BLS labor reports understate true employment levels. The Bureau of Economic Analysis (BEA) reports capture all employment types but BEA doesn’t publish monthly data. The upcoming study from ASU’s Center for Economic Liberty will demonstrate that exclusion of proprietors and farm workers disproportionately affects Kansas in comparison to other states, as Kansas has a higher proportion of its workforce in those categories. Many legislative candidates and media are calling for repeal of the pass-through exemption and while there is a legitimate fairness discussion including other forms of tax preference given to government retirees and businesses, this new data indicates that repeal could also cause significant job loss.